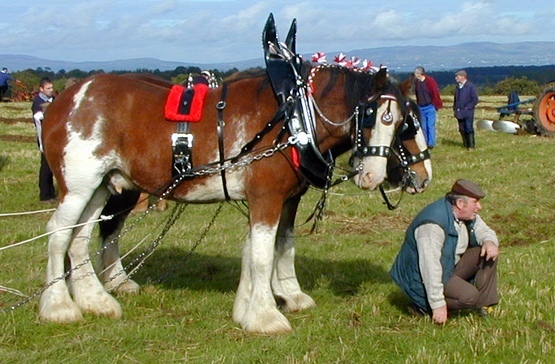 The other day I went to watch the "Northern Ireland Vintage Ploughing Championship" which took place on a big field outside Limavady. It was a popular event and the narrow country lane leading to it was nearly impassable, what with dozens of four-wheel drive vehicles parked all along the road and droves of people - predominantly male - approaching from all directions. 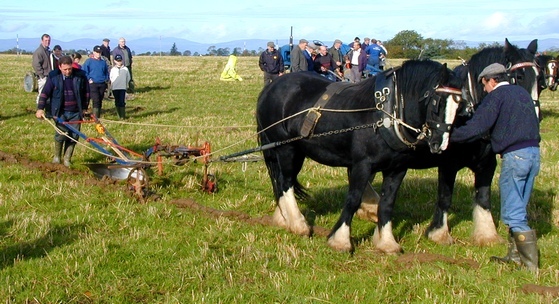 I had never been to such an event and hence hadn't a clue what to expect, but I imagined weather beaten men surmounting huge tractors and/or horses whilst madly racing along - sods flying - to establish who would turn the longest furrow in the shortest possible time. The vicious ones would make use of their whips to slow down the competition like in that old movie 'Ben Hur'. In the turns they would noisily collide, ploughs screaming, horses leaping over stuttering tractors, all tumbling down the hill in a gloriously cursing mess. In other words: A riveting spectacle, testimony to the brawn and pain of Ulster's men of the soil and the power of their resentful horses. As it turned out, in the three hours allowed by the rules, each competitor managed to turn over about as much dirt as my Westphalian great-uncle Gustav would have shifted in ten minutes, whilst saving the horses and re-lighting his stubborn pipe every other furrow or so. But I look ahead. I paid three pounds and parked the car near the top of the field, wondering why so many people had parked along the road. Did they know something I didn't? The view was beautiful: the winding river Roe, distant Lough Foyle and noble Benevenagh in equal measure. Few people were enjoying the prospects though, but hundreds of men wearing big green boots and demonstrating the kind of walk that tells experienced watchers: "I bestride worse fields than this at least twice a day" were strolling over the pasture, which was divided into dozens of little plots; each one of a size that would have given my famous relative about ten minutes' worth of entertainment. From the distance the place looked like a surveyor's convention, because several dozen measuring rods had been carefully positioned in regular patterns. 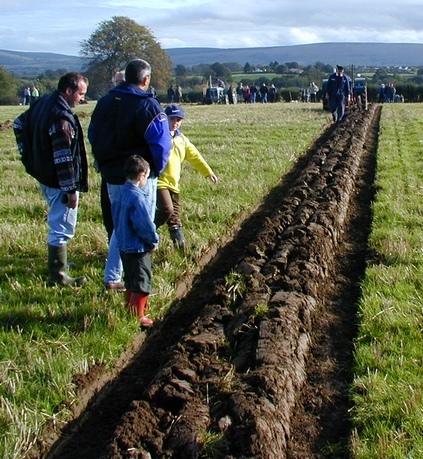 I hadn't realized that ploughing was such a precise art and quickly guessed that each competitor was entrusted with a little square of un-ploughed prime Ulster soil. I waited gleefully for the massacre to begin. Soon everybody busied themselves with producing just a single furrow - which apparently had to be as straight as possible and be of a precise depth, give or take a whisker. It is obvious that this sort of precision does not come naturally to either plough or man. The amount of measuring, aiming, re-aiming, re-measuring and adjusting to just line the contrivance up for the start was incredible. Once all this had been done the race could begin - but alas, in everyone's own good time. The procedure was complicated. In the case of the horse-drawn ploughs it involved one man at the front guiding the horses whilst walking backwards, two horses (walking forward) pulling as slowly as possible and the ploughman guiding the plough with the care and attention to detail you normally only see in the operating theatre of a large hospital. Every few steps or so our surgeon of the soil would stop, critically examine the furrow, mumble to himself, his comrade and the horses, fiddle about with the plough share and then coax the animals another few steps forward. Watching all this in amazement, I began to realize just why they moved so sluggishly. If the front man were to trip - easily done when one walks backwards over a rough field whilst hanging on to two bored horses - the big animals would quite naturally just walk over him - one with two left hooves and the other with two right hooves, followed a short time later by the plough share right up the middle and lastly by both feet of the preoccupied ploughman, who wouldn't notice what had happened because his eyes were glued to the soil. Apart from not being a pretty sight, this would also have the effect of spoiling the straight line and thereby ruin this year's attempt at the championship. Once the furrow had been ploughed - and believe me, man born of woman never saw so straight a ditch - the horses were turned, the plough was manhandled into a new position and re-adjusted, a careful aim was taken, a conference was held, gestures and shouts were exchanged and finally another furrow, precisely distanced from the previous one was attempted. I am sure that this procedure is highly riveting to the knowledgeable participant, though it has to be admitted that the horses looked bored out of their tiny minds. If it hadn't been for the beautiful view I wouldn't have lasted as long as I did, but after ninety minutes or so I gave up in desperation and went home. Championship ploughing is obviously not for the weak hearted and I came to the conclusion that doing it must be considerably more interesting than watching it being done. Some other people seemed to feel the same way, because many were just chatting or indulging in a cup of tea provided in a couple of weather beaten tents from where one had an excellent close up view of the rear ends of the horses not currently taking part in the competition. I don't know the names of the new champions, but I wish them well and hope to see them again next year, when I shall try and increase my patience by bringing a picnic. It is said that the World Championships in this strange sport will be held in Ballykelly and rumour has it that Ben Hur may attend! I shall be there, just in case.